This still beauty will soon go in the basement, or down cellar as we Mainers put it. 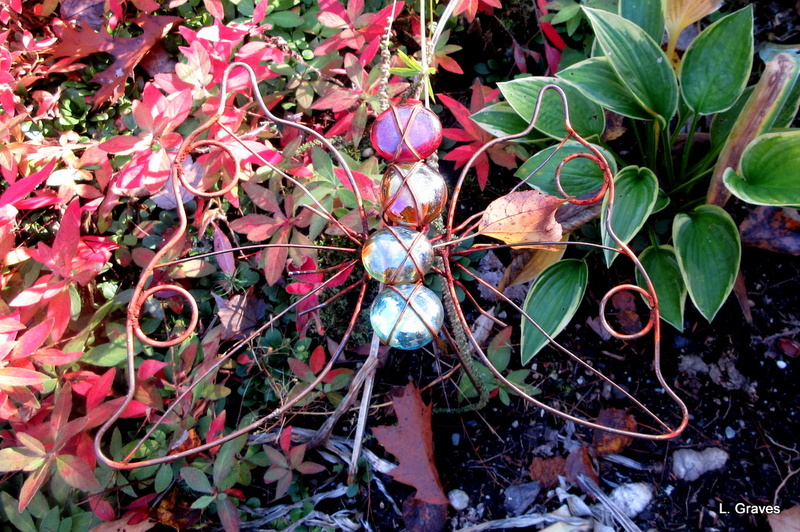 As for the live butterflies…they are gone, along with the dragonflies. Last night, I listened for crickets but couldn’t hear any. 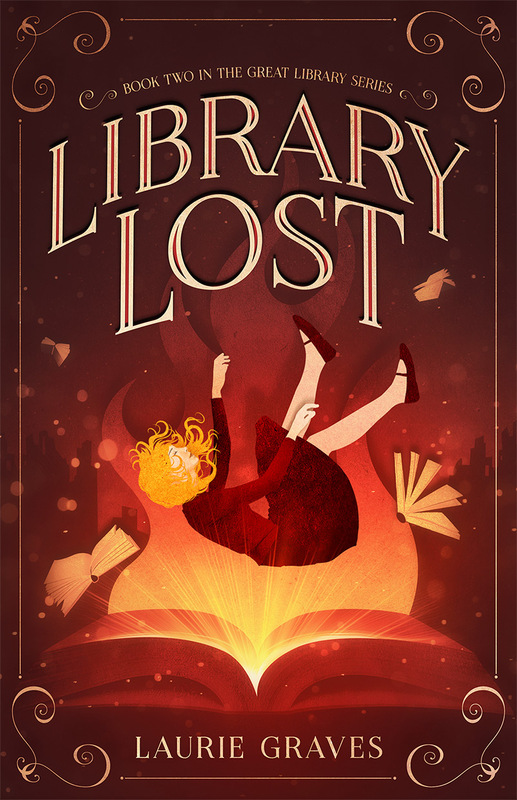 I’ll listen tonight, too, but they might be gone as well. October, with all this loss, it’s a good thing you’re so beautiful. Summer has pretty much come to an end. While the days might still be warm and sunny, the gardens around the house tell a different story—autumn is coming. The back garden is definitely ragged, no two ways about it. 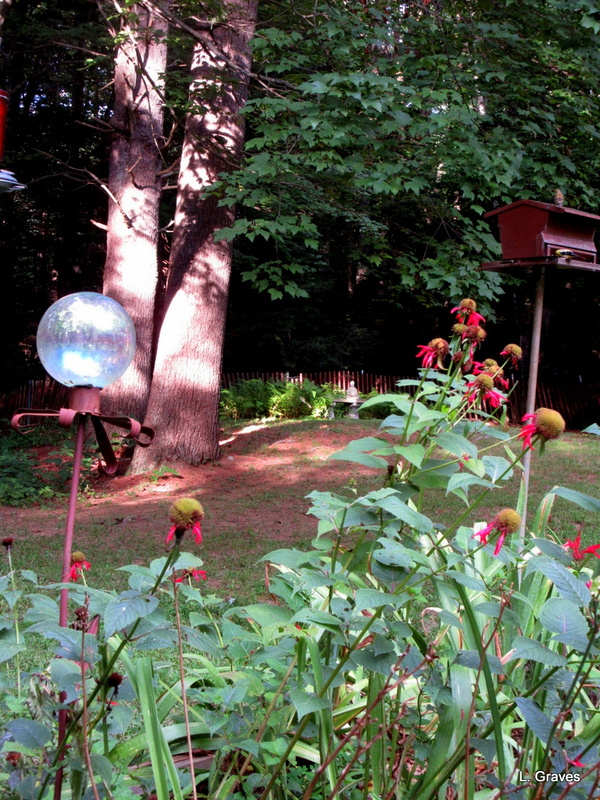 The bee balm is no longer in vibrant bloom, just a few red petals here and there. 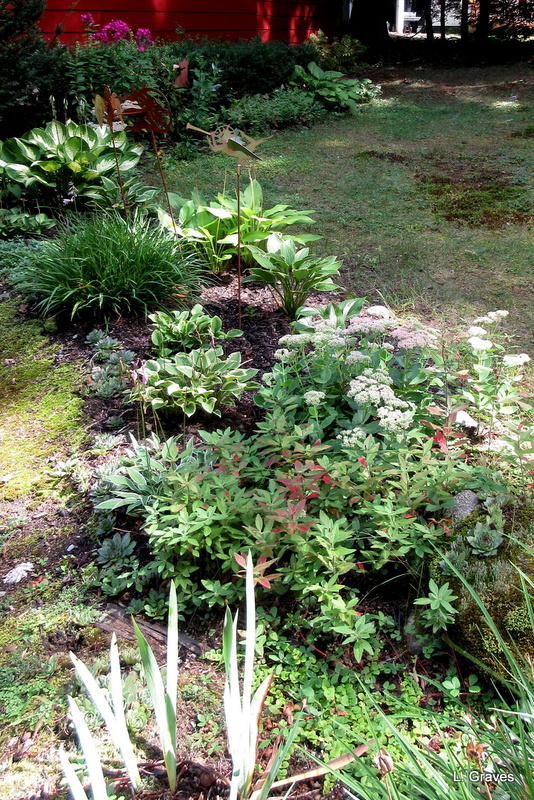 Except for the border of annuals, the rest of the garden doesn’t look much better. 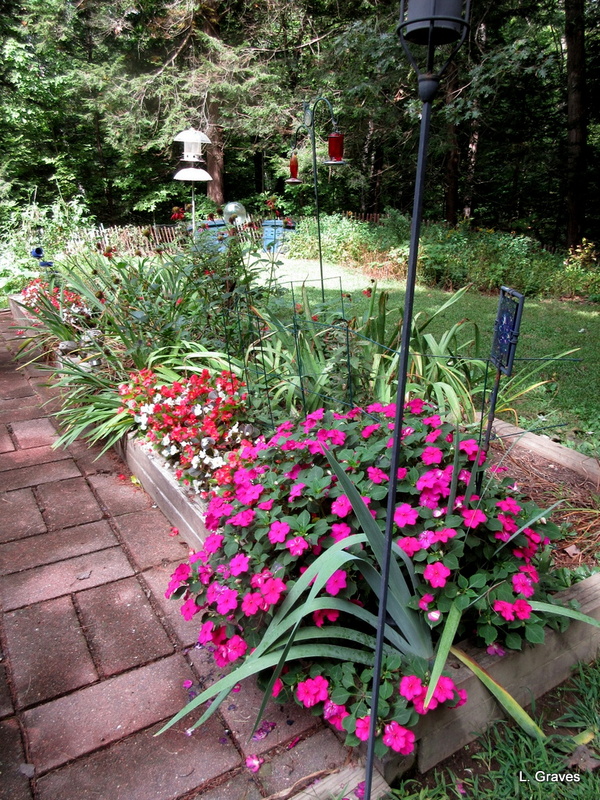 But the impatiens are positively thriving—I have never seen them so big and full. Clearly, they liked the heat and humidity, even if I didn’t. 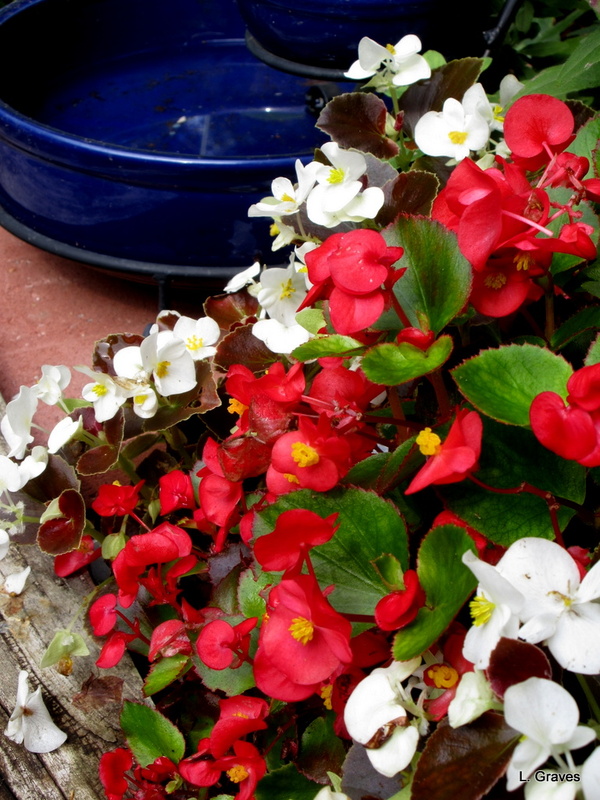 And the begonias, troopers that they are, continue to provide welcome color. The front yard actually looks a little better, and it’s all because of the hostas that I divided and planted in the many holes in my garden. Hostas might not be showy, but they maintain a cool, even presence. Surely there must be a lesson in this. 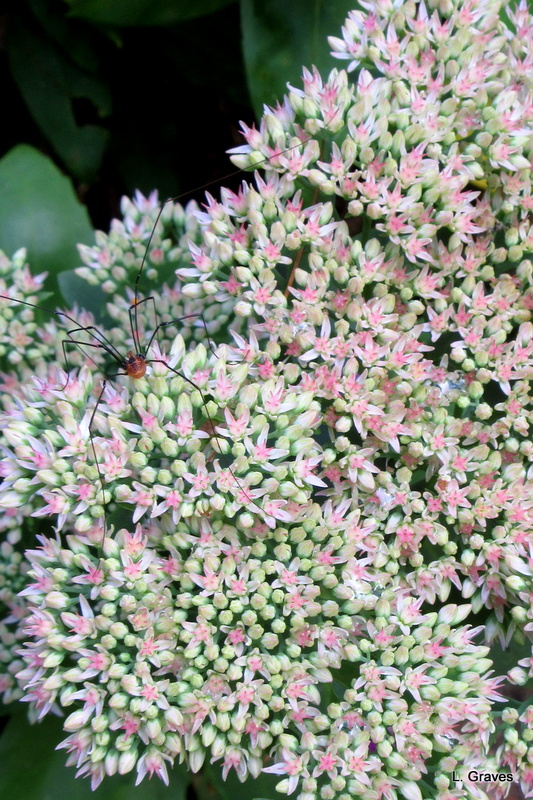 One plant that is coming into bloom is the sedum—autumn joy. Here’s a close up with a little friend on the top. Farewell, summer. You might have been too hot and humid, but I treasure those evenings on the patio, the nights with the windows open, the gatherings with grilled bread. Despite having a very slow start, spring is here, and things are looking up, both figuratively and literally. On a practical level, I can now hang laundry on the line, and I know this might sound a little silly, but this brings me great joy. 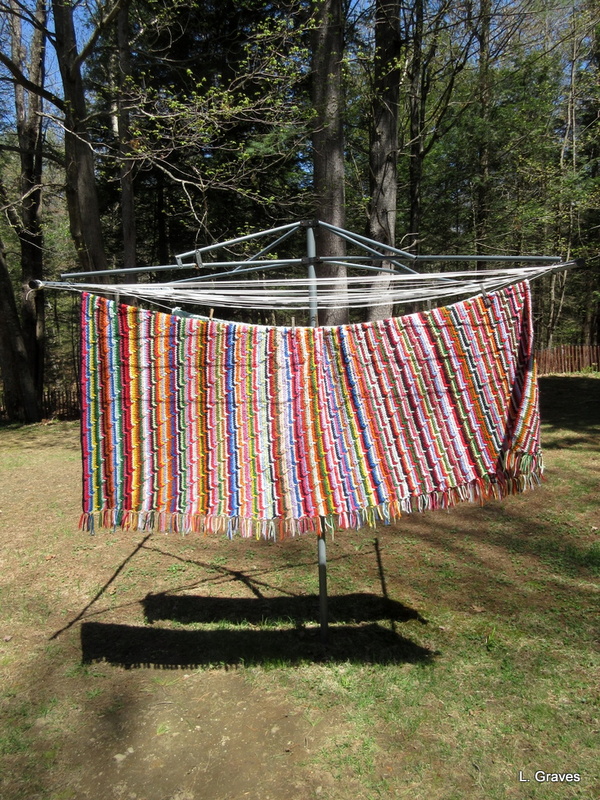 On every sunny day, blankets and quilts as well as other laundry have been hung outside. Here is the picture I take every spring, of a blanket made by my mémère—French Canadian for grandmother. This sturdy, colorful blanket is nearly forty years old, and I use it on my bed in all but the hottest weather. For me, nothing says “welcome, spring” the way this blanket on the line does. 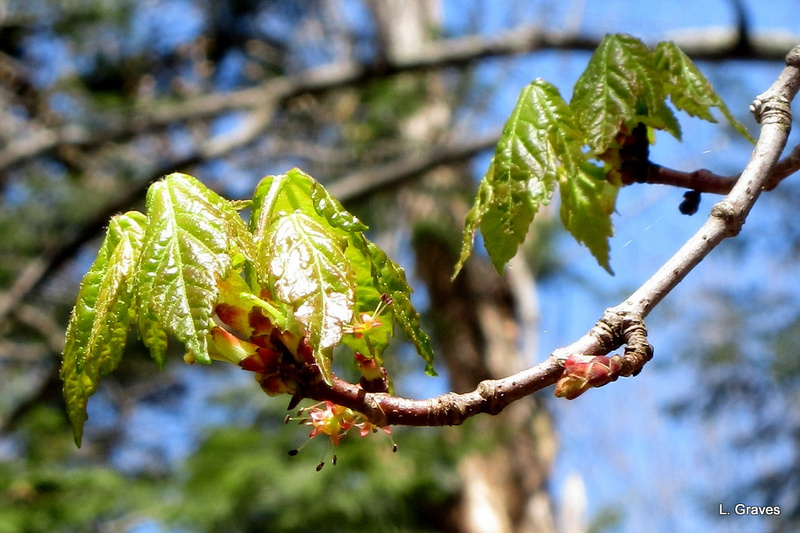 On a literal level, when I look up, I see that the trees are budding. Such sweet, tender little leaves. Then there are the birds. Starting and raising a family is hard, hungry work, and the birds flock to our feeders (pun intended). When I sit on the patio—another spring delight—I watch the birds fly and flutter from the trees to the feeder. Occasionally, my wee camera even gets a fairly good shot. 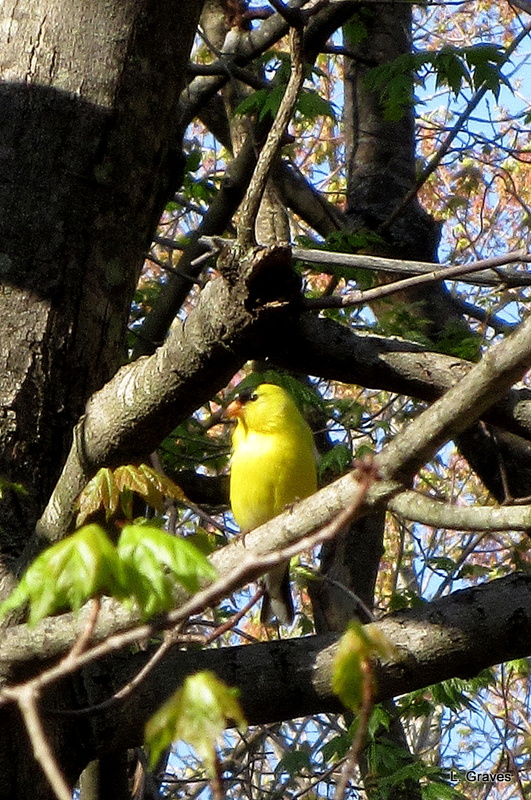 This male goldfinch is resplendent in his yellow summer feathers. 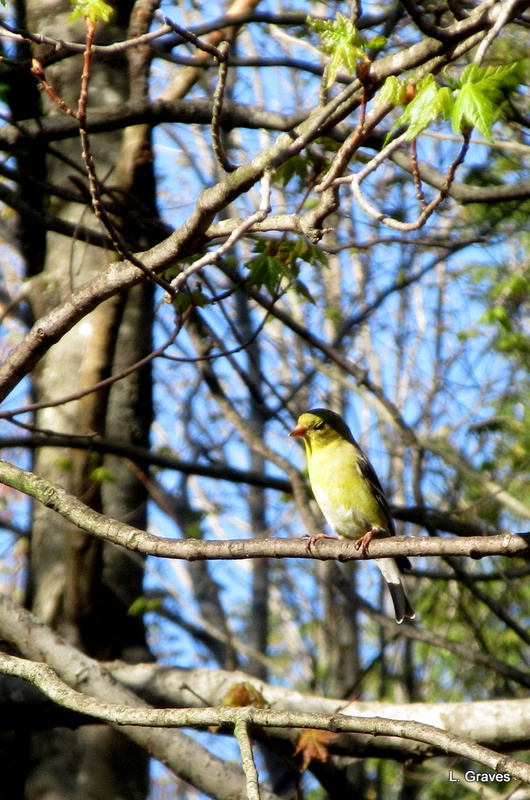 This goldfinch looks pensive, perhaps thinking of how much effort goes into to raising a healthy family. 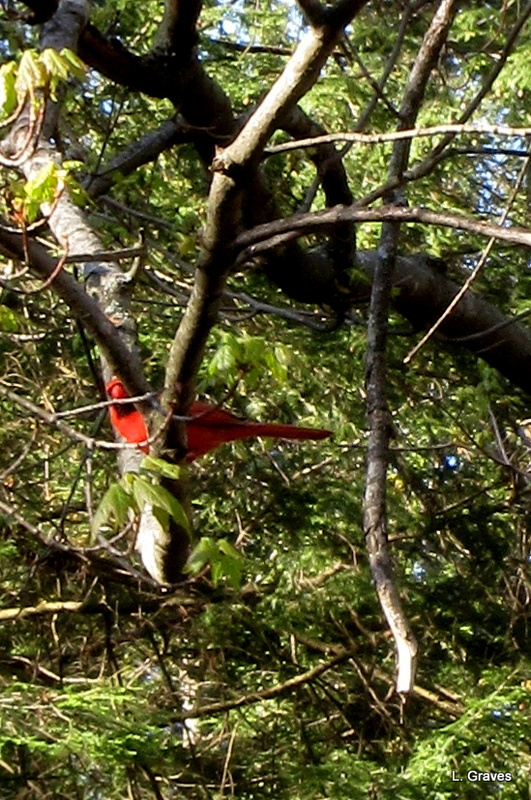 Then there is a male cardinal playing peekaboo. Never, ever a dull moment in the backyard. Looking up is sheer delight. And for blogging friends who don’t have hummingbirds where they live, I promise I will do my best do get a decent shot with my wee camera. This morning, I saw the first hummingbird of the season as she zipped to one of the feeders we have by the patio. An exciting way to start the day. In the spring, looking down at flowers is also a delight, and as more of them come into bloom, I’ll be posting photos of them, too. 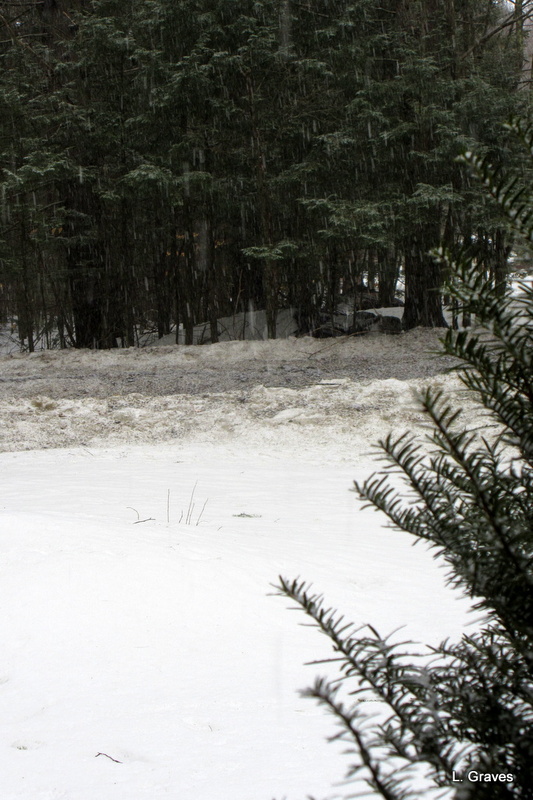 Every spring, mud comes to Maine as regularly as the tourists do in the summer. 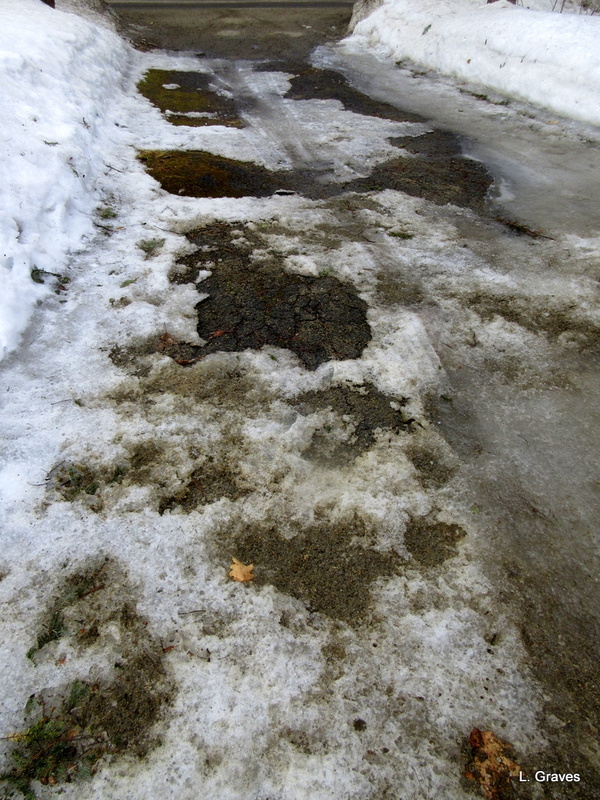 Usually mud season begins Mid-March. 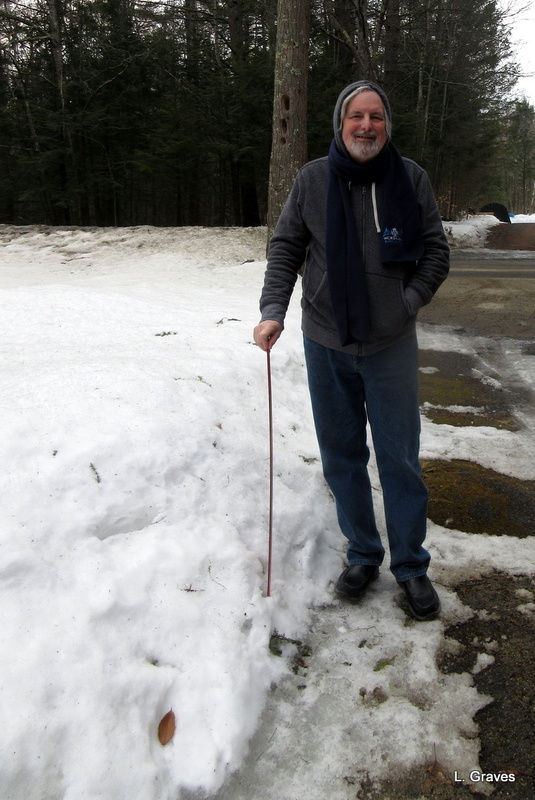 But this year we had so much snow that the mud has not only come later but also with a vengeance that is astonishing even to this Mainer, who has seen her fair share of mud seasons. Yesterday, I almost lost my shoe in the mud by our house, and Liam hates to walk through it to get to the backyard. Unfortunately, he doesn’t have any choice, and he comes back quite literally as a mud puppy. We wipe him as best we can, but oh, my kitchen floor. 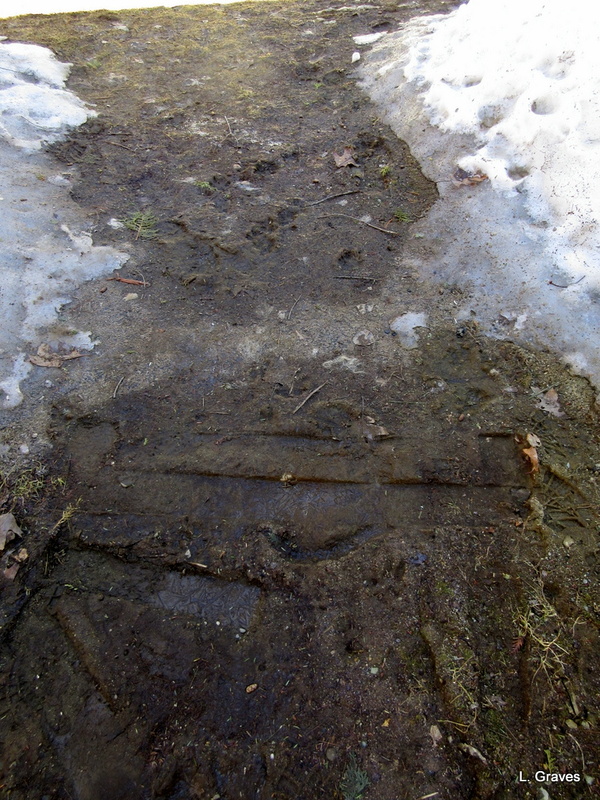 Behold the muddy walk in the backyard, which is ever so much worse in reality than it is in this photo. Clif and I were starting to despair, but last night, salvation came from an unlikely place—Facebook. 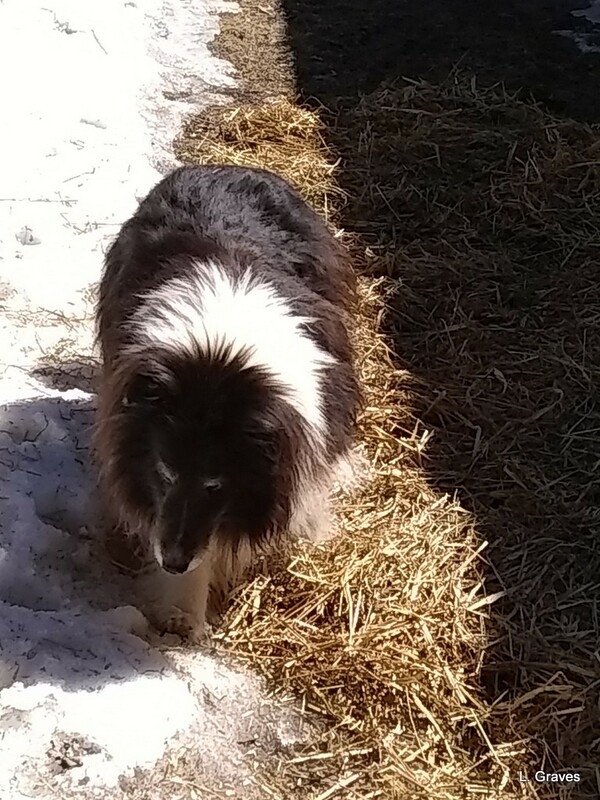 One of my Winthrop friends, who breeds dogs, wrote about how her dog yard was so muddy that she needed to get bales of straw to cover the mud. Bales of straw? Immediately, the idea appealed to me. Where, I asked, did she get the straw? Paris Farmers Union, came her reply. Right in town. 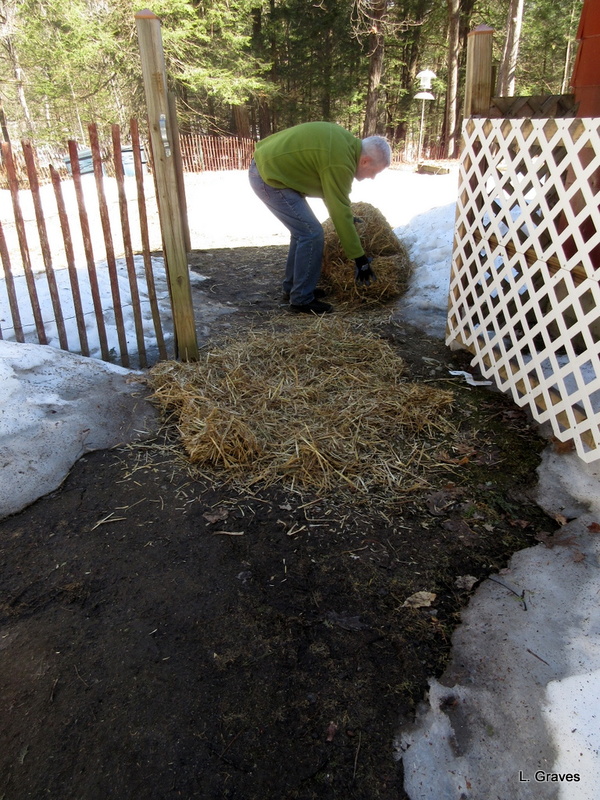 This morning, lickity-split, Clif went to Paris Farmers Union for a bale of straw. 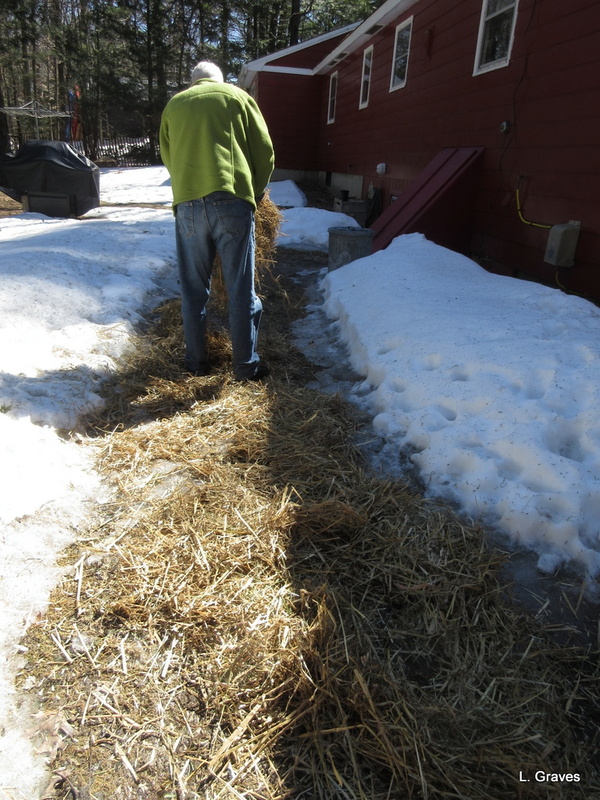 The clerk who helped Clif told him that one man had come to buy five bales for a driveway that was so muddy it was nearly impossible to walk on it. This just goes to show that things could be worse. 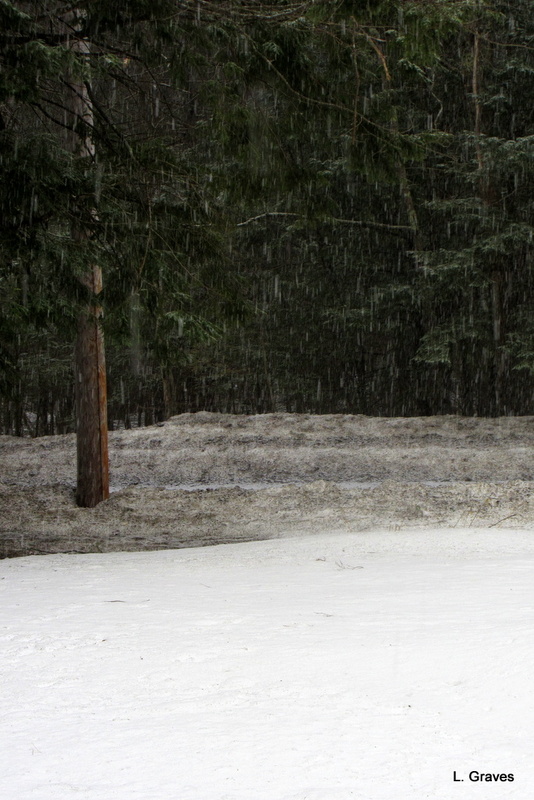 Our driveway is all right. 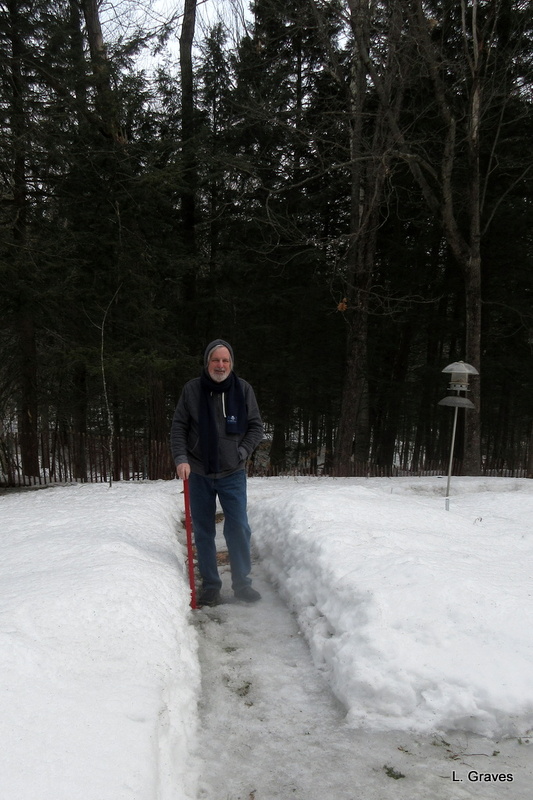 It’s the walkways to and around the backyard that need help. 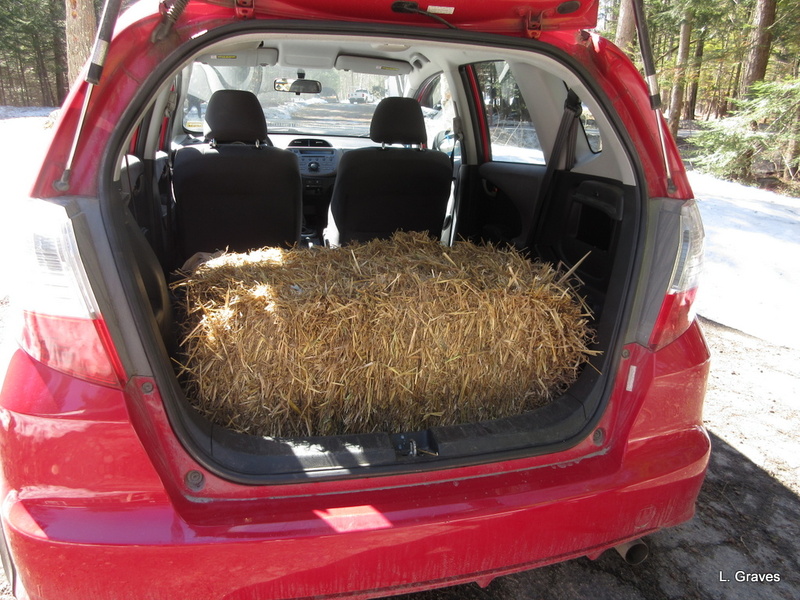 The bale was loaded in our trusty Honda Fit, one of the best little cars we have ever owned. 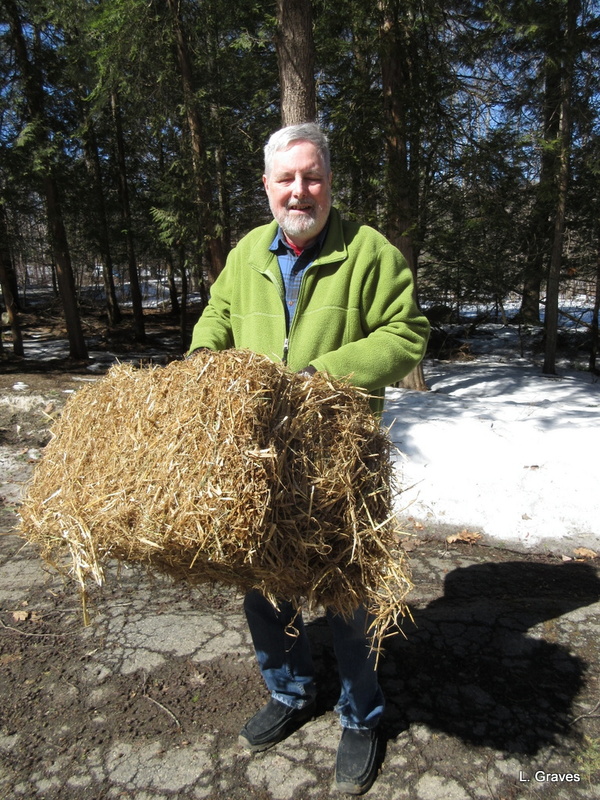 Clif removed the bale and was ready to go. The straw doesn’t entirely eliminate muddy paws, but it sure does help. We still have to wipe Liam when he comes in, but at least he doesn’t track all over the floor. For six days of the week, Clif and I eat a healthy, plant-based diet that includes plenty of fresh fruit, legumes, and salads. However, on the seventh day, we rest and eat what we want. We find that a regular splurge once a week keeps us on the straight and narrow the rest of the time. 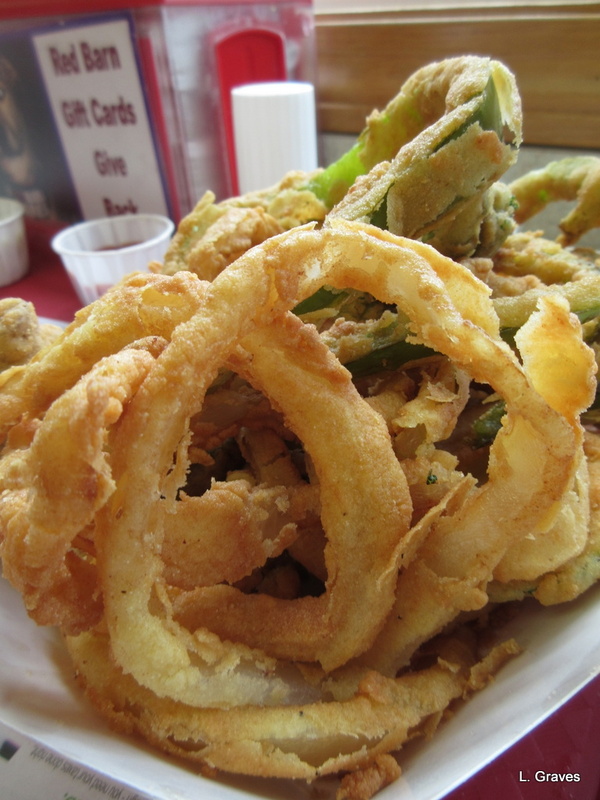 This week, our splurge was at the incomparable Red Barn, where the fried food is so fresh and so reasonably priced that it has almost become a landmark in central Maine. All right. Maybe I’m exaggerating just a little bit, but I’m not kidding about the quality of the food and the prices. 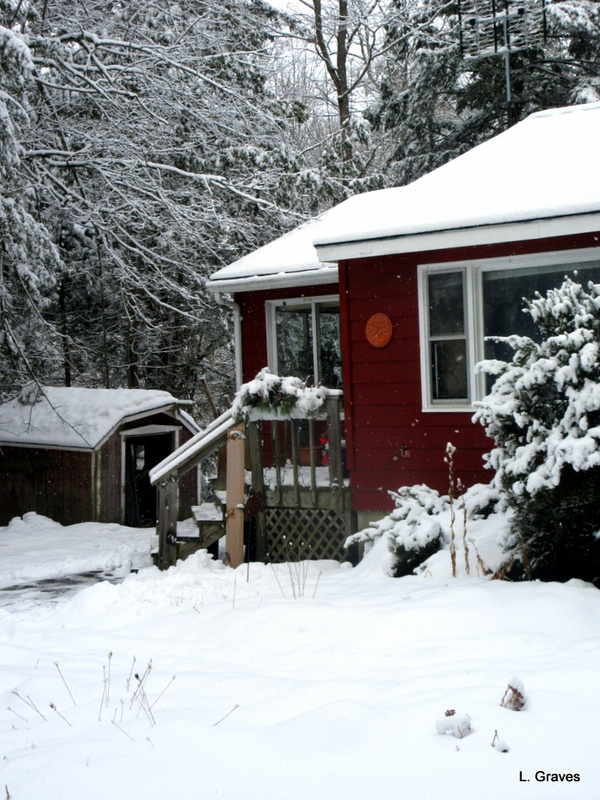 For a treat, the Red Barn is the place to go. 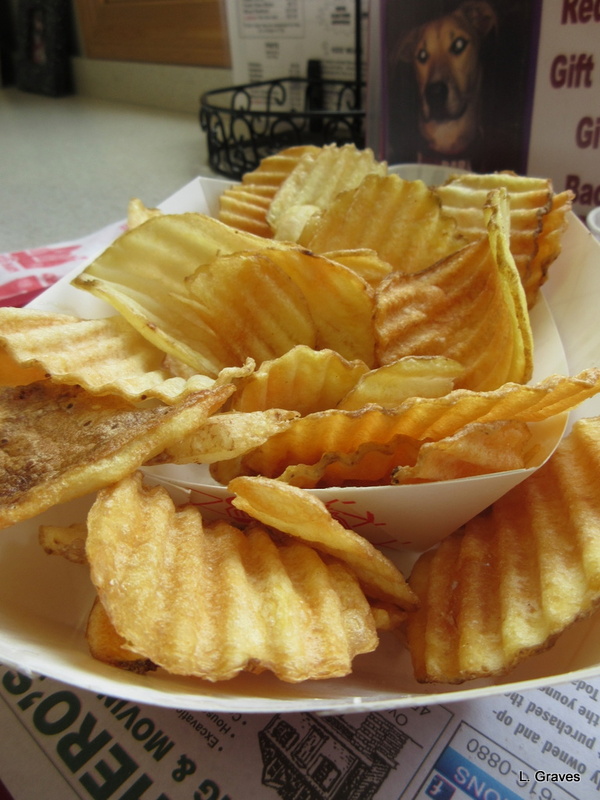 On Saturday’s trip to the Red Barn, we had mixed veggies—I guess we can’t totally get away from our plant-based diet—and homemade chips. Oh my, they were good. The place was packed. All the tables were taken, and we had to sit on stools at the long counter in the new addition. And why not? For the veggies, the chips, a drink that we shared, and a whoopie pie we split, the bill came to $11. Plus this is a very local business that pays its employees well. What’s not to like? While we ate, it rained. The counter where we sat runs below a long bank of windows overlooking the parking lot, and we watched people hurry back and forth from their cars. Trees line the edge of the parking lot, and we saw two small birds—we couldn’t tell what they were from that distance—harass a crow. 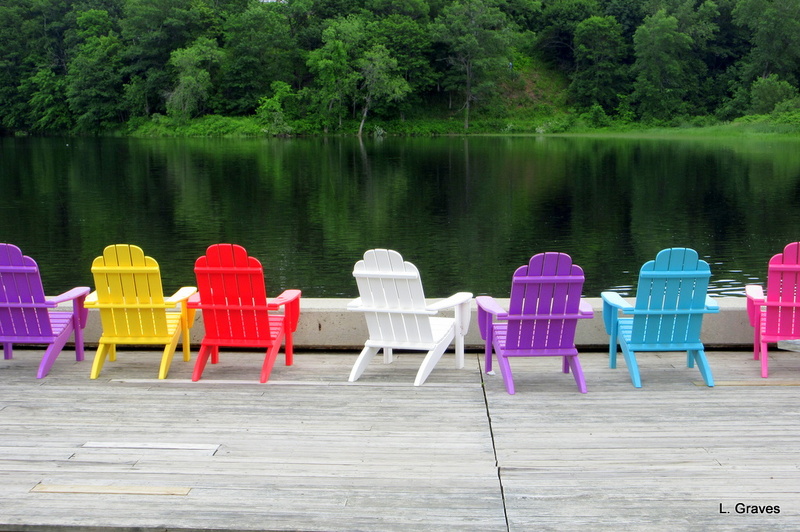 By the time we were done eating, the rain had stopped, and we decided to go to Hallowell, to the long concrete deck by the Kennebec River, to see if the sturgeons were jumping. In late June, early July, the sturgeons spawn and jump. Did they jump for us? They did not. 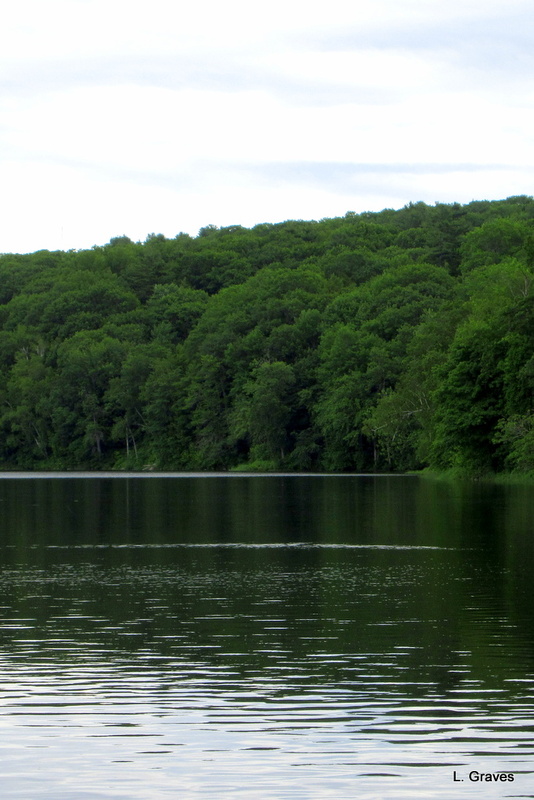 All we saw was were some big ripples and an occasional flash of white. But no leaping prehistoric-looking fish. For some great pictures of jumping sturgeons, here’s a link to a website by Linwood Riggs, a Maine photographer. And to the sturgeons, here’s a song for you, a blast from the 1980s by Van Halen. Yeah, sturgeons, you might as well jump.